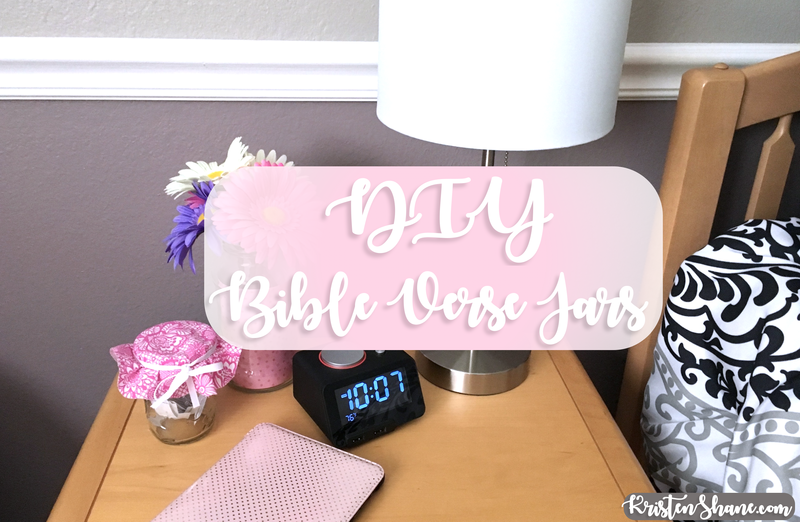 This DIY daily Bible verse jar is an easy way to add a little more faith to your day, for less than $5! I originally created these cute little inspiration/Bible verse jars for the girls in my small group at church last year, but I recently just updated my own jar with more quotes, so I figured I’d share this easy project with you! Basically, all we’re doing is filling up a jar with Bible verses and quotes, so you can read one before bed for a nightly reflection, or whenever you need a little extra motivation or inspo. I created the quote list with the intention that each quote can be a starting place to dig a little further into scripture. If you choose not to decorate your lid or use supplies you already have, you DIY this for about $1 (for the dollar store jar), holla! The goal is to make it so cute that you’ll just have to use it! Grab your supplies! Your jar or container, your decorations, and some scissors. Decorate! You can either cut out the fabric/paper to fit underneath your lid, or you can be extra fancy and cover your lid with the fabric and tie it off with a bow, like I did! Next, let’s fill it up! You can click the link below to download my free printable with over 70 quotes and verses! Once you print them out, cut them into slips, and fill your jar! I found all these quotes from my Pinterest board here. You can add your favorite quotes and Bible verses, too! Put your jar somewhere you’ll see it, so you’ll be reminded to use it to add a little extra grace to your day (and that’s something we all could use, right?!). I have mine on my nightstand next to my bed, and isn’t it cute? I chose pink fabric, of course, to match my other decorations life. It’s really that easy. Now, you have the cutest little Bible verse jar just waiting to inspire you!! I love to hear from you, so leave me a comment below if you decide to make this easy DIY, or let me know what Bible verse you’d add! Thanks for reading, friend, I’m so glad you’re here!! Love this idea! I will have to try this. Loved This!! So much I decided to make it today for my friend! I decided to paint the jar purple and put sparkly spray paint over it and then used a grey floral cloth on top of the lid. I also made all of your verses different colors to add some more fun! Love the idea of choosing a bible verse each morning! Such an awesome diy!! So cute thanks for sharing! I love DIY’s!! I absolutely love this! <3 Definitely going to try making one of these! This is so cute. This is perfect cause I always highlight or make notes in my bible and sometimes it’s hard finding my favorite quotes. This is super helpful! Yes this is a great way to keep them all together! !